Eleven inches of splendiferous craftsmanship and Templar design in this bolster Release Automatic. 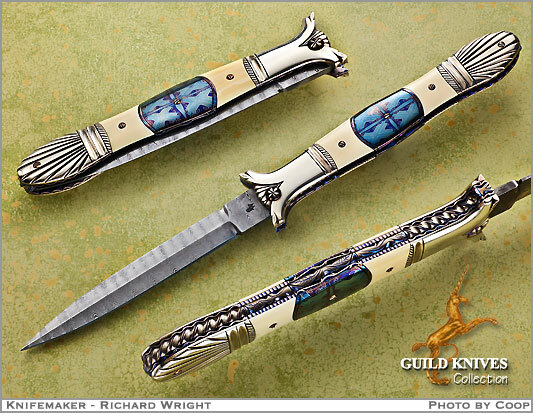 If you want complexity of filework, design, inlays, bluing, steel carving, custom screws, and numerous other appointments, this is the knife for you. Note the â€œPopes Hatâ€ silver pommel. Detailed carvings and Ivory inlay inside the knife. One of the blued plates has a 1/16 inch bluing fade which Richard will easily re-blue if desired.